Three week ago, I set off with some gaming buddies on a five hour road trip to Indianapolis, Indiana, to attend Gen Con, the largest RPG gaming convention in the United States. Billing itself as “The Best Four Days in Gaming,” the con is a gigantic gaming whirlwind of crowds, cosplay, and commerce that takes over central Indianapolis. Having previously only attended Gen Con in 1993, when it was somewhat smaller and still located in Milwaukee, Wisconsin, I was a bit unprepared for the sheer scale. Nevertheless, I had a grand time and look forward to attending again next year or the year after, finances and time willing. In walking around the con and interacting with gamers and game designers alike, I increasingly found myself struck by what I perceived as an unusual dichotomy in the overall RPG con experience, namely the omnipresence of and critical distance from history and cultural heritage. What exactly do I mean by this? Well, on the one hand, it’s not altogether surprising to me that a hobby that emerged from the historical simulationist wargaming clubs of the 1960s-1970s would have history and cultural heritage baked into his bones in a fundamental way. And, at an event billed as a celebration of all that is sundry and good in gaming, this characteristic manifests quite clearly. For example, one could not walk more than fifteen feet in the main convention center without having some represented, remixed, or repurposed idea or artifact of cultural heritage pop into one’s line of sight. Cosplay, of course, was an important component of this, from people in reproduction medieval armor and medieval garb to guys dressed up as Second World War soldiers of various combatants to a young lady dressed as the goddess Athena from the original 1981 Clash of the Titans movie (I’m not making this up; it was a remarkably subtle choice for a cosplay outfit). In the dealer hall, the commodification of history and cultural heritage was everywhere and in your face. I found handcrafters peppered throughout the hall, selling items like leather-bound journals with homemade paper or reproduction medieval clothing. Book dealers hawked used and out-of-print RPGs, literally selling pieces of tabletop RPG history (an older dealer selling a hodge podge of 1970s-80s era items, including Judges Guild stuff, absorbed the attention of one of my friends for a while). 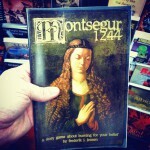 I stumbled across innumerable history-based RPGs, some more twisted and remixed than others. 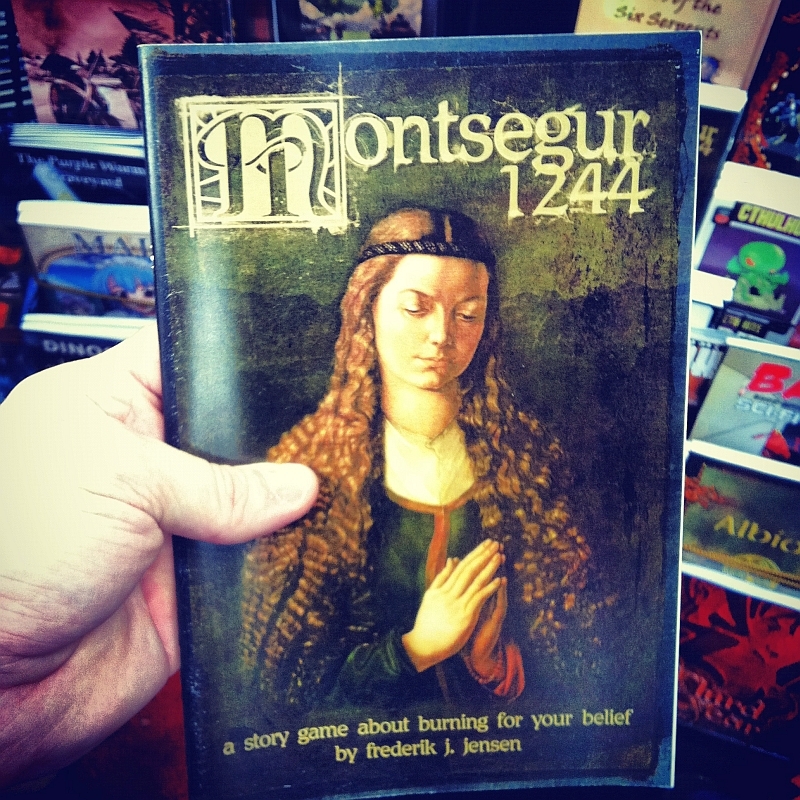 Two that caught my eye were Montsegur 1244 by Frederick J. Jensen (an independent story game set during the thirteenth century Albigensian Crusade) and Godlike by Dennis Detwiller and Greg Stolze (a superhero RPG set during the Second World War). At one point, in the back of the hall, I pushed my way through a crowd to find a massive wargaming demo of a Second World War desert battle (which, presumably, was the Battle of El Alamein, but I didn’t fight my way further forward to ask). On the other hand, despite this omnipresence, there is an element of distance that comes through when considering the con and RPGs in general and their relationship to history and cultural heritage. In one sense, it’s the History as Building Blocks phenomenon writ large. RPG designers, players, and publishers use history and cultural heritage in their games and products in whatever way fits their creative, playful, or economic vision, but there is also an undercurrent of antagonism in this appropriation that I hadn’t particularly considered before. And the sentiment seems to be this: like a dangerous cobra sitting on one’s back porch, one must handle the use of history in RPGs with care. It was in the con’s non-gaming programming that this idea jumped out to me. In looking through the rather convoluted events website database, I came across a few panels here and there that touched on explicitly historical topics or concerns. Some were merely sessions tackling various historical and foreign policy topics as part of the National Security Decision Making Game (for instance, sessions on the Arab Spring or the Irish Easter Rising in 1916). Others focused on the mechanics and practical advice of using history in gaming and game design, demonstrating quite clearly this notion of distance. For instance, on Saturday, I attended a panel entitled “History, Panic, and History Panic,” which was a seminar led by game designers Kenneth Hite and Jason Morningstar (what an awesome name for a game designer, by the way…) that touched on how to relax when running or playing a historically-based RPG. Predicated on the premise that a historical RPG is not work of history but often players feel constrained by what Kenneth Hite called the “implacable jaws of historical materialism” when playing through the games, both designers answered a variety of questions from the audience, ranging from how to reduce one’s anxiety in joining a history RPG while being a novice on the history content or how to avoid giving players a massive historical info dump when running a game to concerns about managing historical expertise in a gaming group (e.g., when you set a game in Hong Kong without having been there and then have a player join who lived there for several years). It was all rather interesting, even if there were the occasional jabs at academic historians (for no other reason than because, apparently), but this sense of history as a dangerous animal in the room was noticeable nonetheless. Ultimately, as is evident from this Historical Hit Points series of posts on tabletop RPGs, the dialectic between historical fidelity and historical utility in RPGs both fascinates and perplexes me at times, even in the sweltering crowd chaos that is a gaming con. In the next installment, which should drop on Play the Past sometime in October, I will be interviewing a freelance game designer about their thoughts on this dialectic in how they actually create games. See you then.